In a competitive talent market, employers are typically looking for new ways to provide the latest and greatest in employee benefits, eager to be the best place to work. One of the latest benefits to come to the corporate world is incorporating a dog-friendly atmosphere. 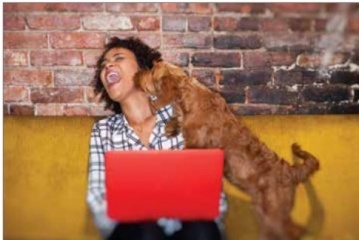 In fact, a survey from Mars Petcare found that 87 percent of employers in the United States believe that being dog-friendly helps them retain and attract more talent. • Put safety first. Keep your dog out of pet-free areas by using a leash, gate or crate while you are at work. If you are leaving your area, be sure to fetch your pup so he is never left unattended. • Give everyone – even dogs – a desk break. When you decide to get a drink of water or step away from your desk for a few minutes, it’s probably time for your furry friend to go on a break, too. Take your dog for a quick walk to stretch his legs, do his business and smell the summer flowers. • Follow the golden rule and always ask permission. It’s important to always ask permission to pet anyone’s dog, your co-workers’ included, since they know the best way to approach their pups. New environments and smells may lead to overstimulation for some pets, so if your canine companion gets overexcited, aggressive or anxious around your co-workers, be sure to take him outside for some fresh air, or even home, if necessary. • Entertain your pet. If your pet is bored, he may act out. Don’t forget to play with your pup periodically and be sure to bring your pet’s favorite toys from home to stimulate his mind throughout the day. • Don’t forget the snacks. Stock up on treats to reward your pet’s good behavior and keep him happy and satisfied. Dental treats such as GREENIES ™ Dental Treats or PEDIGREE ® DENTASTIX ™ Treats help clean your dog’s teeth and freshen breath, so you and your co-workers can enjoy your pet’s company without bad dog breath getting in the way. To learn more about how to safely bring your pup to work this summer, visit BetterCitiesFor- Pets.com, where you can download the Pets Work at Work toolkit and find more information on the survey results.